Kareena Kapoor has plenty of reasons to celebrate with her having topped the poll of the leading female endorser as per the AdEx India Analysis 2010. As per the report, the Bollywood actress had the maximum advertising share of ‘celebrity’ endorsements on TV during H1 2010 – a whopping 45% with Bollywood’s most sought after Kareena Kapoor leading the pack. Bollywood beauty Deepika Padukone has kissed Saif Ali Khan on screen. But her new co-star Neil Nitin Mukesh was a virgin kisser on camera when the duo locked their lips last week. Neil had no choice but to succumb to a torrid kissing sequence with Deepika. Katrina Kaif and Neil Nitin Mukesh have one thing in common. They both follow a no-kiss clause. Katrina broke her self-imposed bow of smooch-celibacy in New York. The flats on top floor of the apartment that is on construction just opposite Fortune Heights have nothing much to do with the whopping prices of real estate properties in Bandra west. It is the apartment owned by Saif Ali Khan and Kareena Kapoor on the tenth floor of Fortune Heights that has set the prices of flats in the upcoming multistoried building on fire. The office of Saif’s production house too is on the second floor of Fortune Heights. The flats in the building overlooking Bollywood’s celebrity couple’s living room have been a treasure trove for the wily builder. The chote nawab seems to be all cool with his current beau’s family. He recently made a trip to London in order to spend some quality time with his kids and former wife. 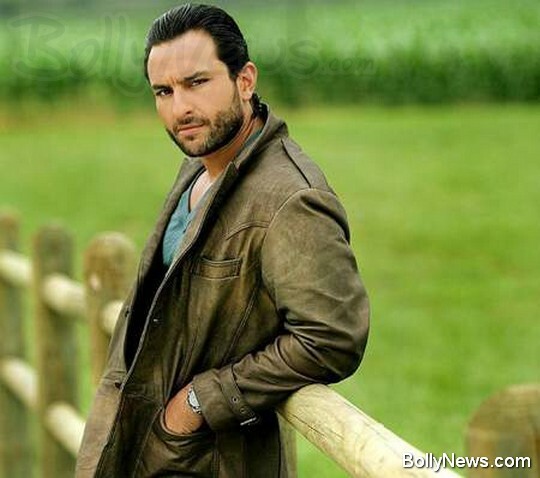 Saif Ali Khan is making the most of his trip to the UK capital. The actor, who had some spare time flanked by his Agent Vinod’s schedule, was certain to spend class time with his kids. He is vacationing with his kids Sarah and Ibrahim there; no doubt about that. However there is yet another family with whom he’s been spending some time as well. Recently, the Chotae Nawab, Saif Ali Khan essayed the role of a very responsible dad. He indeed is a devoted boyfriend and would ‘follow’ his beau, Kareena almost anywhere, but he recently surprised the world when he achieved a greater degree of responsibility to be with his kids and his ex-office Amrita. Saif Ali Khan has been rigorously training in the most complex martial arts for his role as a spy in Sriram Raghavan’s Agent Vinod. Saif’s latest acquisition to amplify the scope of his action scenes will make our other action stars go green with envy. It would certainly disappoint Vivek Oberoi to know that Saif has beaten him into getting the Prince of Persia action director Cedric Proust to do the stunts in Agent Vinod. Bollywood actor Saif Ali Khan’s charm has fascinated the British actor John Harris, who earlier edited the actor’s Hindi movie Being Cyrus, which was directed by Homi Adajania. Jon’s latest movie The Decent 2 is going to release in India on July 2. During the promotion of the film, the director was asked to name a Bollywood actor with whom he would like to make a movie. He promptly quoted the name of the Junior Nawab of Pataudi, Saif Ali Khan. Saif Loses 9 Kilos, Gets a New Look, Goes into Hiding.. Comes Out on Aamir’s Insistence! Saif avoided cameras and paparazzi pictures until his departure to Morocco this week in order to avoid giving away his Agent Vinod look. But man proposes, Aamir disposes. Aamir insisted that Saif make it to the party at his home last weekend, thereby blowing the whistle on Saif’s carefully-concealed look. Comments Off on Saif Loses 9 Kilos, Gets a New Look, Goes into Hiding.. Comes Out on Aamir’s Insistence!